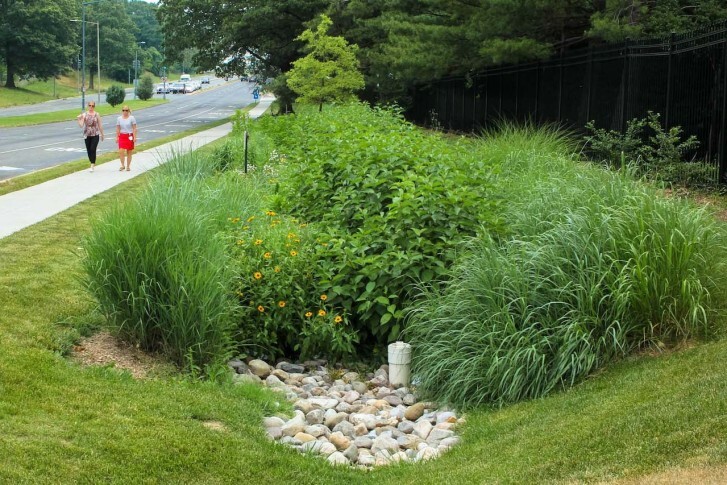 The D.C. Water and Sewer Authority has issued the nation’s first Environmental Impact Bond, raising $25 million from the Goldman Sachs Urban Investment Group and the Calvert Foundation, and will use the proceeds for an experimental green infrastructure project. WASHINGTON — The D.C. Water and Sewer Authority has issued the nation’s first Environmental Impact Bond, raising $25 million from the Goldman Sachs Urban Investment Group and the Calvert Foundation, and will use the proceeds for an experimental green infrastructure project. The project, part of part of DC Water’s $2.6 billion Clean Rivers project, also will mean new jobs in the District. It’s the first green infrastructure project for DC Water, and it will be designed to mimic the natural process of absorbing and slowing stormwater surges during heavy rainfall, to reduce the volume of sewer overflows into the District’s waterways. “It is solving a problem that has existed in the city for more than a century, which is a combination of sewage and rainwater overflowing into our rivers in big storm events,” DC Water General Manager George Hawkins told WTOP. “Green infrastructure is a way to improve water quality, neighborhoods and air quality, and it offers great jobs,” he says. For this project, DC Water will start by addressing about 20 acres of impervious surfaces, such as roads and sidewalks, and transform them into pervious surfaces to absorb stormwater runoff. DC Water is working with Mayor Muriel Bowser’s office on a green jobs initiative for local workforce development and sustainable job creation. The initiative includes training and certification opportunities for District residents for jobs including construction, inspection and maintenance. The way the EIB is structured, the worse this project performs, the smaller the return on the investment Goldman and Calvert get. That might seem counterintuitive, but that is how social impact investing works. “Green infrastructure is an outcome that Goldman Sachs and Calvert want to see undertaken in urban areas. So by making this investment and helping insure us against an outcome that none of us want [and] by accepting less of a payment in case of lower performance, more enterprises are likely to engage in green infrastructure,” Hawkins said. DC Water thinks it will be a model funding mechanism that other cities can use to advance the use of green infrastructure. “This environmental impact bond represents the first time that DC Water has explicitly tied financial payments to environmental outcomes, in this case reducing stormwater runoff,” said DC Water Chief Financial Officer Mark Kim. The Calvert Foundation, whose investments focus on affordable housing and the environment, is based in Bethesda, Maryland, so this investment is in its own backyard. “This work is critical for residents in our hometown and has national implications for how to finance green infrastructure solutions,” says Beth Bafford, the Calvert Foundation’s investments director. Goldman Sachs established its Urban Investment Group in 2001 to make loans and investments that benefit urban communities.